This is a basic pipe headloss calculator which enables you to determine the pressure (head) required at one end of a pipe to get the required flow at the other end. This is designed for simple, single-pipe runs and will not work for networks. This calculator uses the "Hazen Williams" calculation. • Why does headloss change with pipe size? • Why do I need to calculate the headloss? • What does the "curve" on a pump chart mean? • Why am I not getting the flow I expected from my plastic pipe system? *This calculator is provided for free use by Plastic Pipe Shop Ltd. The results given by this application should be used as a guideline only. By ticking "accept" you confirm that you have read and accepted our Terms and Conditions of use (if you don't tick it the calculator will not work!). Headloss (also sometimes referred to as friction or pressure loss) is a measure of the amount the flow rate will be slowed down by a combination of friction with the pipe wall and turbulence as the fluid passes through fittings. Wall Friction: The amount of friction between the fluid and the pipe wall is dependent on the make up of the fluid and how rough the pipe wall is. The thicker the fluid and the rougher the pipe wall, the more energy that is needed to push it down the pipe. In addition to this, the higher the percentage of the fluid that is in contact the wall, the more it will be slowed, and the faster the fluid is flowing, the greater the friction. Turbulence: As the fluid flows down your pipe line, it will hit twists and turns, and at each of these, the nice straight, linear flow of the water down the pipeline will be upset. To visualise these, imagine a nice 100m long, straight, open channel of water. In the middle, the water will be flowing fast and calmly, but at the edges it will be more turbulent as it is being held back by friction with the channel wall. The water level at the start of the channel will be higher than the water level at the end of the channel. The difference between the two is caused by the friction with the sides and bottom of the channel, slowing the water down. The water must be higher at the start of the channel to provide the energy to overcome that friction loss and push the water down the channel. Now introduce a sharp bend in the channel; the water doesn't flow around it gracefully, but tries to continue in a straight line, hitting the wall and being deflected off at an angle round the corner. This causes a lot of turbulence and the water loses some of its energy. If you measured the water level before and after the corner, you would find that the water is higher before the corner than after. This difference is the friction loss or "headloss" for that corner. So, the same thing is happening in your pipe line: the pipe wall causes friction loss and the elbows, valves, tees etc. are causing turbulence. To push your water past these losses it needs enough energy at the start of your pipeline. If you don't have that, then the losses will slow your water down and you will get less out at the end of your pipeline. This is because the smaller the bore of the pipe, the faster the fluid has to flow down it to deliver the same flow rate at the end. The faster the flow rate, the more turbulence there is in the pipe and the greater the friction losses from the wall of the pipe. Both of these increase the headloss. Why Do I Need to Calculate the Headloss? Without working out a headloss in a system you are in very real danger of either not having enough flow at the end of your pipeline, or spending more than you need to on larger pipes or pumps than actually required. What Does the "Curve" on a Pump Chart Mean? 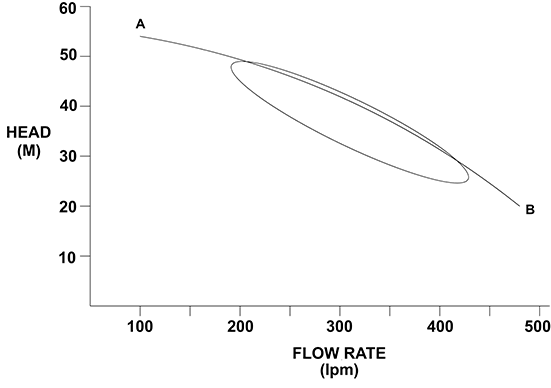 Most pumps come with a graph that has the pump curve on it (see below). The curve above is typical of the type you will see for a centrifugal pump. The shape of the curve is determined by the design of the impeller and the cavity it sits in. Some pump curves will be flatter, others steeper, and others more curved etc. but they are all read the same. Point A on the graph shows the maximum head that the pump will deliver, which in this case is 53m (5.3bar). This is also the maximum pressure that would build up in the system if all valves were shut. What the graph is saying, is that beyond this pressure, the impeller is so inefficient that it can't push against it anymore. The trade off at running at that pressure with a pump curve like the one shown, is that you will only get 100 lpm flow rate from the pump. Point B on the curve is the maximum flow you will get from the pump, but again, with it being at the other end of the curve there is a trade off and this flow will only be delivered with a pressure of about 20m (2bar). Ideally, you want to choose a pump that your required flow and pressure fits somewhere within the oval area a little below the curve line. That will then give you scope to increase your flow or pressure a little if you need to. So, for example, this pump would be ideal for a system requiring 300 lpm at 40m (4bar) pressure. Why Am I Not Getting the Flow I Expected from My Plastic Pipe System? • Is there a restriction in your pipe system somewhere? All it needs is one restriction and your flows can be compromised. Some designs of non return valve are very restrictive and engineers sometimes enlarge their pipe, putting a larger sized check valve in, before reducing it down again. • Your system could have an air lock in it. An air lock does not necessarily stop your flow, but can work in the same way as a restriction, especially if the flow rates in your pipework are low. Check for any parts of your system where the pipe rises and falls again. An air release valve can be fitted, although some engineers simply put in a stainless self tapping screw with PTFE round it to seal, so they can release any air by taking out the screw. A preferred option is to redesign that section of pipe to stop the air lock happening on the first place. • There could be some fouling to your system. Check the inlet, the pump impeller and anywhere else debris could collect. Even just a small amount of fouling on the impeller (some twine through it or similar) can have a huge effect on the flow rates.